Don't let icy temps prevent you from seeing nature's cold-weather creatures. The trees may be bare, the sky gray, but there are still plenty of wildlife viewing opportunities across the state. Refuges and backyards are all very much alive with the sound of beating wings, scampering paws and hungry chirps. With a few expert tips, you’ll find plenty of reasons to explore the outdoors this winter. And, of course, the best way to view wildlife is at a distance, preferably with binoculars. Distance gives wildlife a buffer to prevent unnecessary stress. 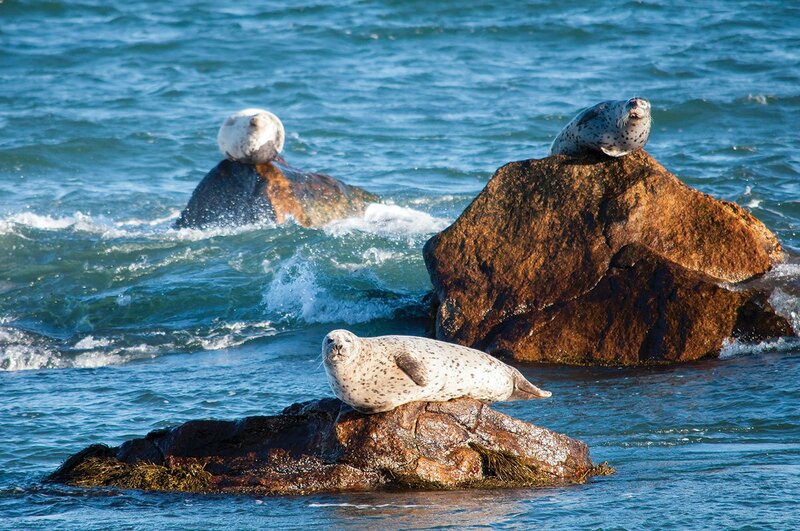 Harbor seals are a common sight throughout Narragansett Bay. They migrate from the chilly Maine and Canadian coasts and reach peak numbers in late March and early April. While they overwinter in the bay, they eat different fish species, crustaceans and squid. When they’re not fishing for their next meal, you’ll find the seals resting or “hauled out” on rocks. A great spot to see them is at Rome Point (John H. Chafee Nature Preserve, Boston Neck Road between Route 1A and Hamilton Allenton Road and Route 138, North Kingstown, romepointseals.org). The best time for viewing is a few hours before low tide, and a westerly wind is preferable to a calm day. Save The Bay also has incredible Seal Watch and Nature Cruises that bring you to the heart of the bay with the opportunity to see seals up and down the coast (savebay.org/seals). Flying in from the Arctic and onto Sachuest Point National Wildlife Refuge (769 Sachuest Point Rd., Middletown, 847-5511, fws.gov/sachuestpoint) are the snowy owls. These mostly white majestic birds are a delight to observe from at least 200 feet away. 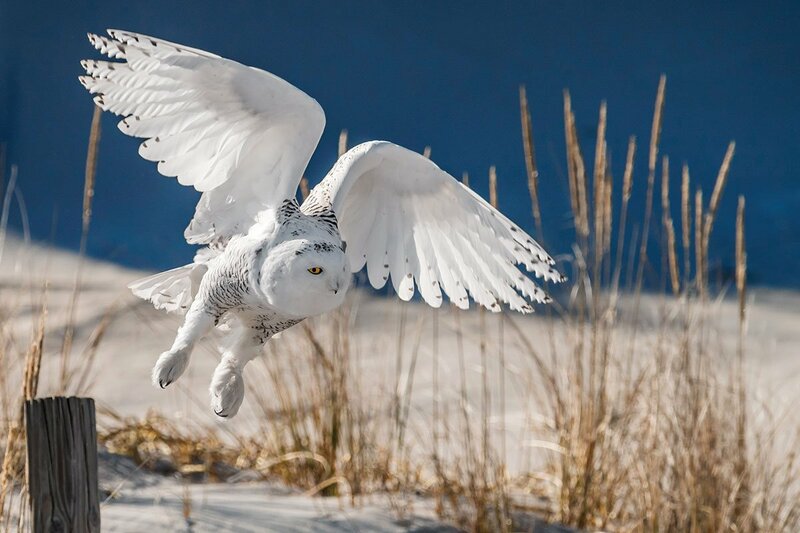 Unlike other owls, they are most active during the day (diurnal) and at sunrise and sunset. You’ll most likely find them perched on the rocky outcrops just offshore when they’re not hunting for small mammals or birds. The refuge even has powerful stationary spotting scopes for the public to use for free to observe the birds in all their feathery glory from a safe distance. Remember, it’s against the law to disturb migratory birds. Just off the gently sloping rocks of Beavertail State Park (Beavertail Road, Jamestown, riparks.com/locations/locationbeavertail.html) you’ll find a curious duck riding the surf. 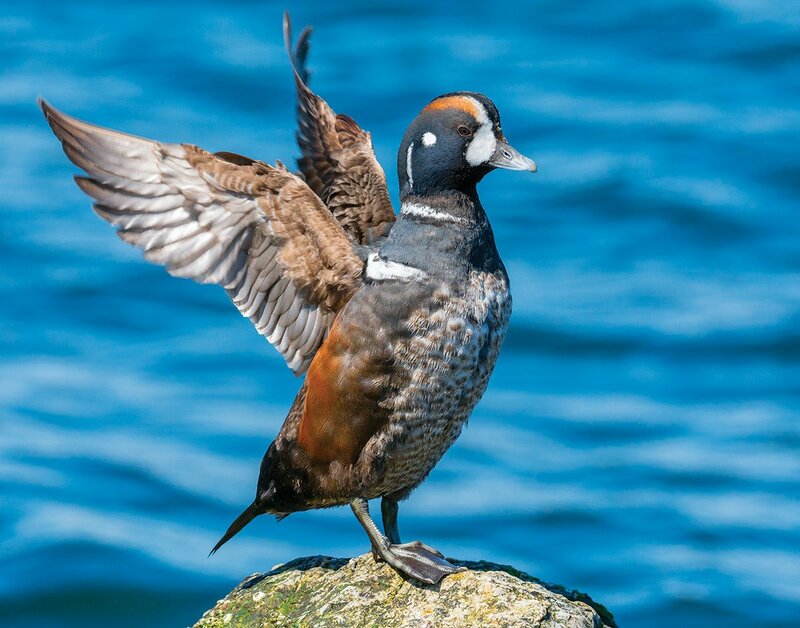 Harlequin ducks are easily spotted by their striking white markings on top of a navy blue base. Although they have the appearance of a jovial clown, there’s nothing funny about the great lengths they go to for a meal. They’re often spotted among the turbulent waves, diving for mussels, periwinkles, crabs and small fish.